ORMAND C. JULIAN, M.D. ; WILLIAM S. DYE, M.D. ; WILLIAM J. GROVE, M.D. SURGICAL separation of the cohered leaflets of the stenotic mitral valve has become established as a satisfactory operation. * As an application of a new principle, it has from the earliest reports by Bailey † provided a relatively constant and high proportion of good clinical results. Aside from minor variations, some of which are undoubtedly improvements, there has been little change in the technical aspects of mitral commissurotomy. Although, with greater experience, the safety and the anatomical thoroughness of the procedure have improved, there has been little real change in the percentage of good results. 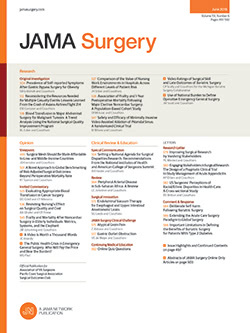 This, however, has not been a matter of wide dissatisfaction because of the continuous, rather high proportion of good results and because of the realization that certain aspects of the disease process prevent more accurate preoperative prediction of what commissurotomy will do for individual patients.